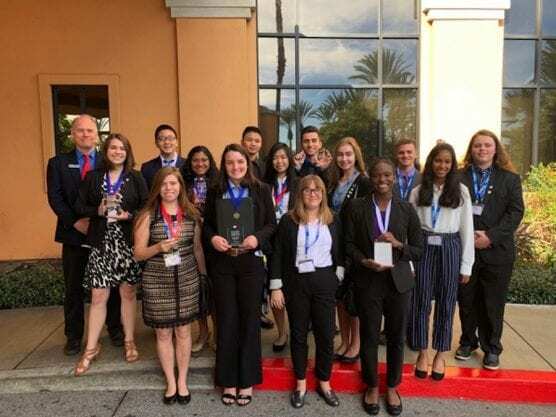 The DECA Chapter from Valencia High School recently competed in the 2019 Southern California Career Development Conference. Valencia took 14 students, grades nine through twelve, to a conference in Anaheim. The students competed in over twenty business categories for the first competition of the year, which involved taking an exam and two professional business interviews called role plays. Six out of 14 of Valencia’s competitors got Top 3 overall; Kristen Beckwith (12) 1st Place in Food Marketing Series, Katie Ticas (11) 1st Place in Apparel and Accessories Marketing, Shani Tyson (12) 2nd Place in Marketing Communications, Madelyn Begley (12) 3rd Place in Quick Serve Restaurant Marketing, and Jenna Peterson (11) and Daniel Judah (12) 3rd Place in Hospitality and Tourism Team Decision Making. All of Valencia’s fourteen students medaled in one of their categories including the ones who placed overall.